Tani 2018 appeal video for the world senbatsu sousenkyou. Like last year, lets supports Tani so that she can finally rank up! 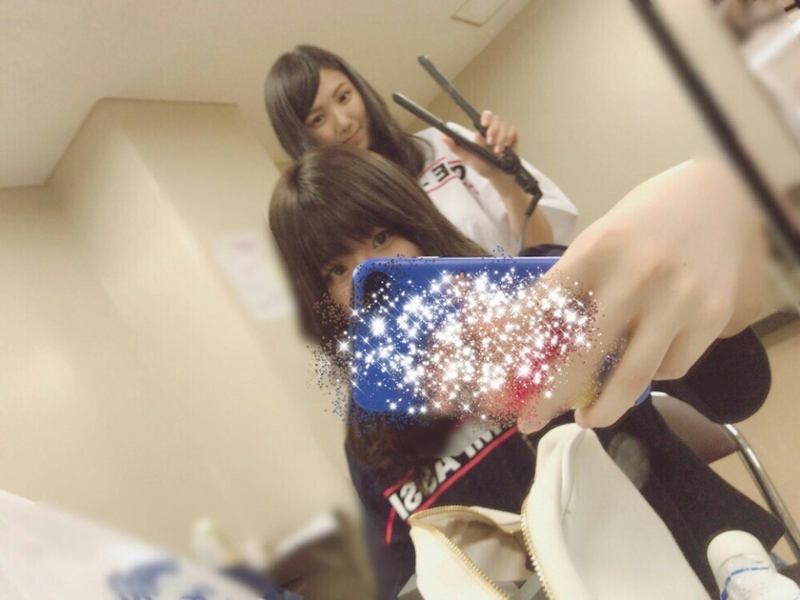 Today’s Ameblo update will be the last one. 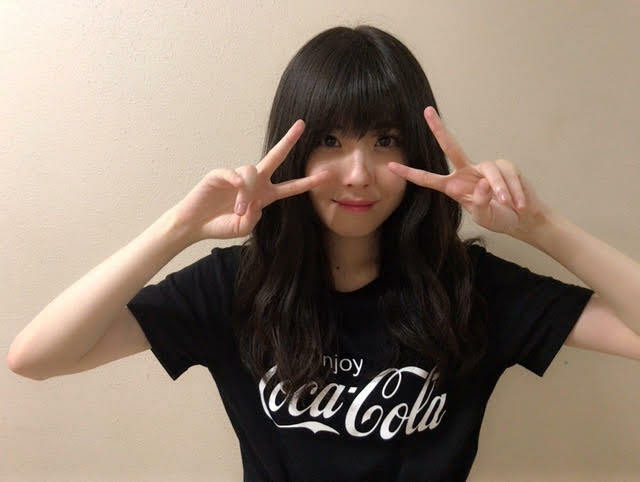 I was able to write this special blog for about two years because I was a senbatsu member! I am very honored. 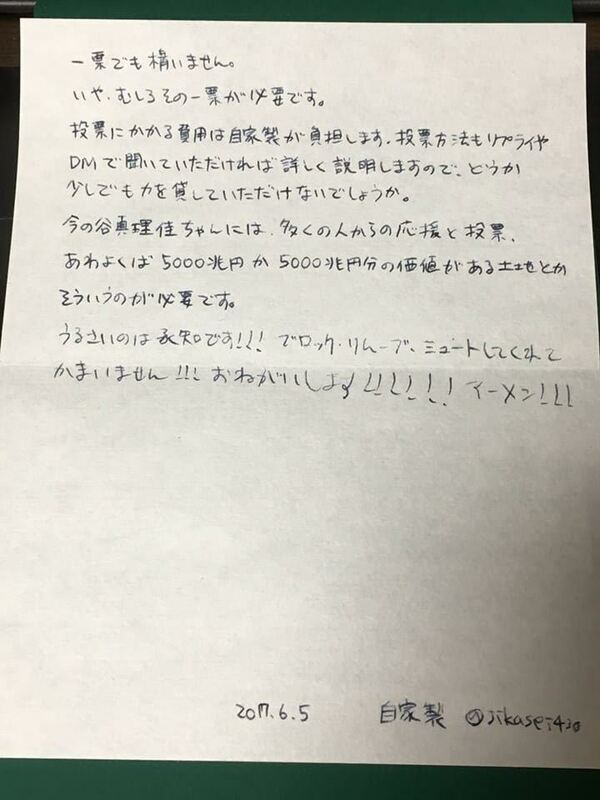 To the fans who read it, thank you very much!!! 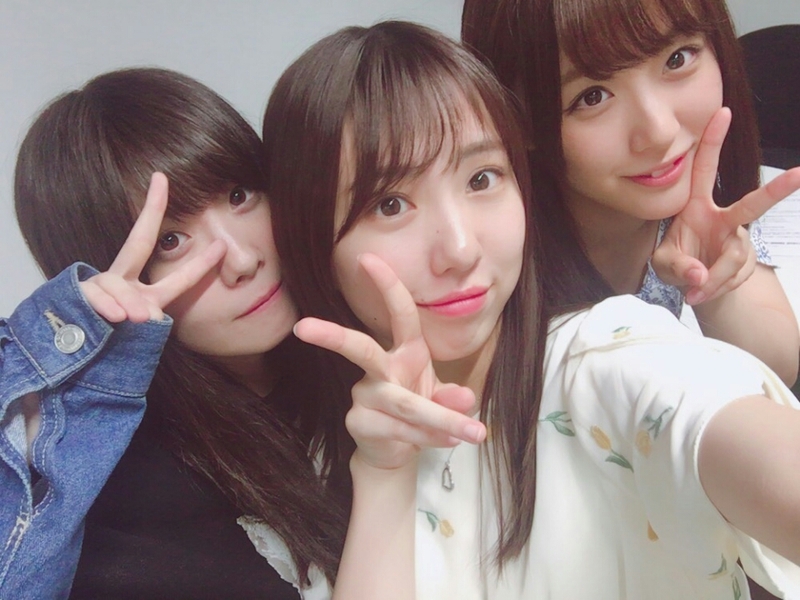 Even now, I will not forget the joy from the increase in the number of people who know of Tani Marika’s existence because of Ameblo and from the people I met at the Handshake Event. I will never ever forget it. I will not forget the awesome view I saw when I was on a music program. I do not want to forget it (^_^)!!!!! I will reflect upon this feeling of happiness! Being able to update this Ameblo. Made me very very very happy! Tani is happy as long as Tani is able to convey even a small amount of my feelings. To all of my fans who read, commented and liked my blog! Thank you very very very much. It is a miracle that I was able to participate in so many songs consecutively!!! It was a very happy two years!! I started in a position that was so good it was shocking, and when I was in a position where I could see the others’ backs or in any form like that,, very much!!! There was no difference to the fact that I felt happiness. I will put all of my effort into being happy!! Thank you for loving Tani Marika! I am happy if you continue to love me from now on. Thank you very much for all your support. Give a vote to Tani | Ma | ri | ka my name is (Jikasei). As the final date of the General Elections comes closer and closer, how are you all doing? There is something I would like to ask of you at this moment, and thus I am handwriting this letter instead of doing a tweet. 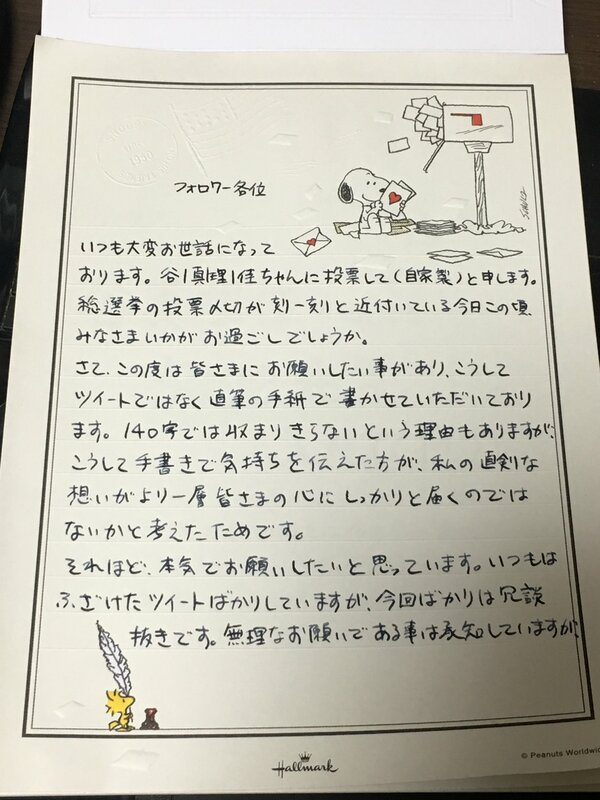 A partial reason is that it won’t fit in 140 characters, but the main reason is because I felt that handwriting my thoughts would better communicate my serious feelings to your hearts much more. Give five quadrillion votes to Tani Marika. If you can’t, just one vote is fine. What Tani Marika needs right now is that one vote. If possible, even eight quadrillion votes would be okay. If you could lend just a little bit of your help…? Please, thank you very much. As I announced last time!! There are highs and lows in the writing compared to last time. It ended up being a very heavy blog post. It was announced the other day! my name is not in the next single. Knowing both that I ranked out and the date that it would be announced, I was trying to really prepare myself… but when the time came, I found myself blanked out. To be honest, every time a single is announced I would be happy but would also think what if I’m not on the next one? I would find myself feeling very anxious. What I thought most when I ranked out. “What will the faces be like of the fans who support me? Will they be sad for me?” “What should I say to the other members?” I thought while biting my lips. The very first thought in my mind was the faces of the fans that support me. the usual Tani Marika, my energetic self! 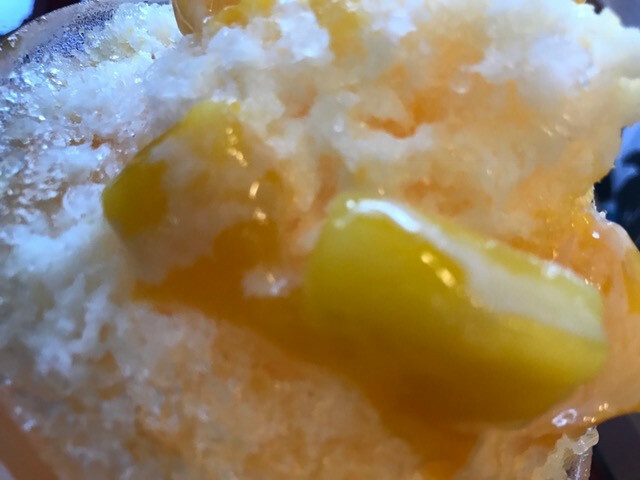 I updated the blog with a funny, masochistic post. instead I caused people to worry about me (＞＜)! Everyone is kind. Thank you. I read all the comments on SNS! There were more warm and loving comments than I thought there’d be and I realized anew that I’m surrounded by love. That alone makes Tani happy! my heart is in much pain. cries here, then it’s no good. If I cry in front of everyone, I will become no good, everything up to now will go to waste, I feel, so I don’t want to cry. Finding myself like this, I feel ashamed. the fact that I ranked out. I’ve already accepted the fact that I ranked out, which is sad! my own effort wasn’t enough. If I can just contribute even a little more to SKE! is what Tani Marika thinks. over and over and over!!! doing their best or not doing their best behind the scenes. It’s not all sad things. There were happy things, too!! Which is about Tani’s blog the other day. But I went straight to running away with jokes. Sorry (/ _ ; ) chuckle. there are so many members who understand Tani. I received many Line messages, too. I’m sorry to have worried everyone (/ _ ; )! I love all these loving members!!!! so I had only written the following on mobile mail. for myself after I moved to SKE. I was really happy and cried a lot. a special form of me. I feel regret that that form has disappeared. to all the HKT48 fans who still support Tani Marika. received me warmly at SKE48. that I couldn’t remain in that form. I’ve been ranked in! And that I continued to rank in. and still have them now. and because of the fans and their support. There was nothing I regret having unfinished while in SKE48. I will improve myself and give it my best in this present! I didn’t want to cause people to have sad faces. but what I can say now is only the above. with everyone on June 17th. I’m excited about the new SKE!!!!! I’m so happy mango~ that you’ve read it! Thank you for support as always. This is Jikasei. The Senbatsu Members for the 21st single of SKE48 has been announced. 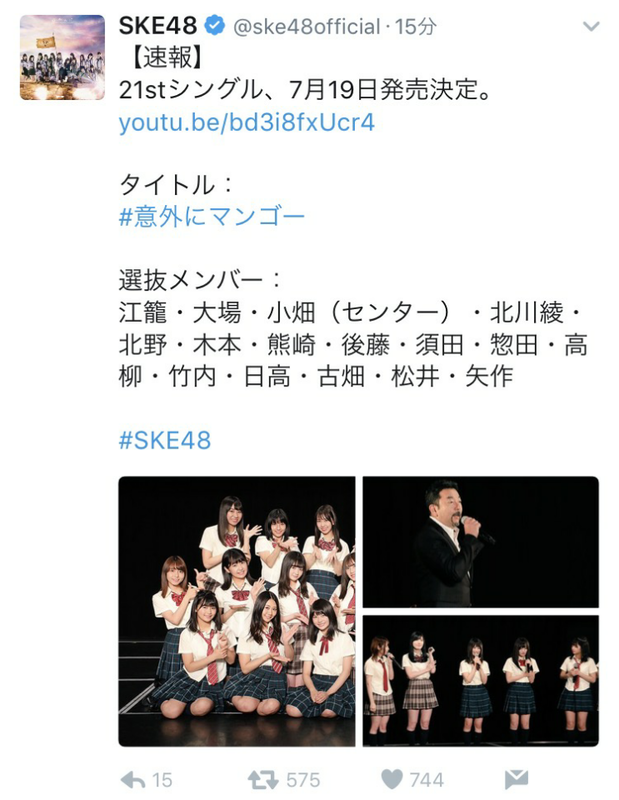 The Senbatsu Members are the 16-20 or so members selected to represent the more than 70 people of SKE. These few years, Tani Marika had been chosen as a Senbatsu Member continuously. However, Tani Marika’s name was not among the list of Senbatsu Members for the single this time. While I’m sure it stings her more than us fans, Tani Marika is the type of person to not show tears or a sad face in front of us fans. 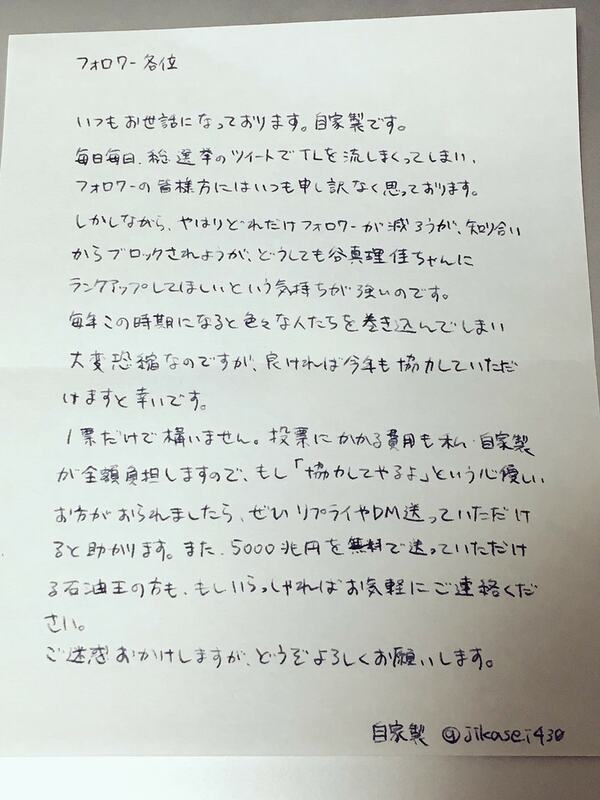 What has been decided can’t be changed and all there is to do is to accept that Tani won’t be in this single and she won’t be able to post on the Ameblo, which is limited to Senbatsu Members only. 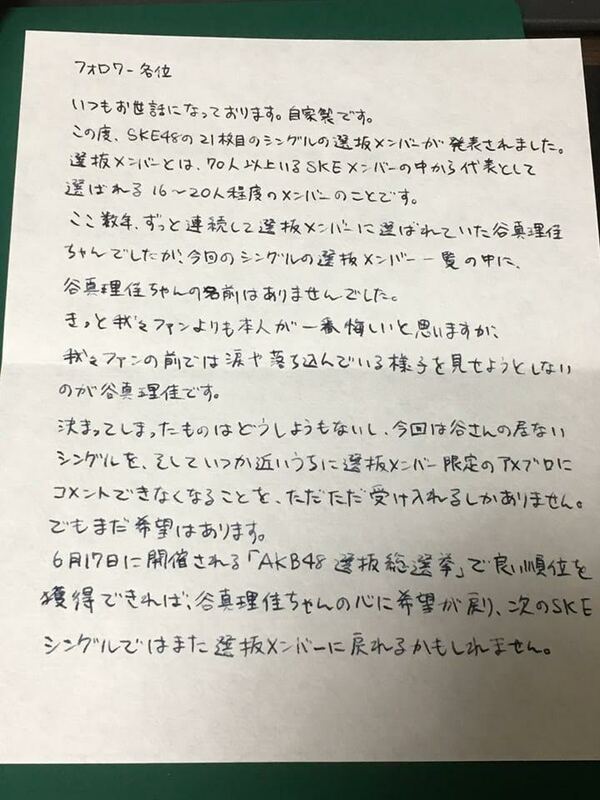 If a good rank can be obtained on the “AKB48 Senbatsu General Elections” that will be held on June 17th, hope in Tani’s heart may recover and she may be able to return to the Senbatsu Members in the next SKE single. Just one vote would be fine. No, rather, that one vote is what’s needed. I will cover the costs of your vote. Just reply or DM me and I will explain the voting method in detail. Please lend just a little bit of your help. 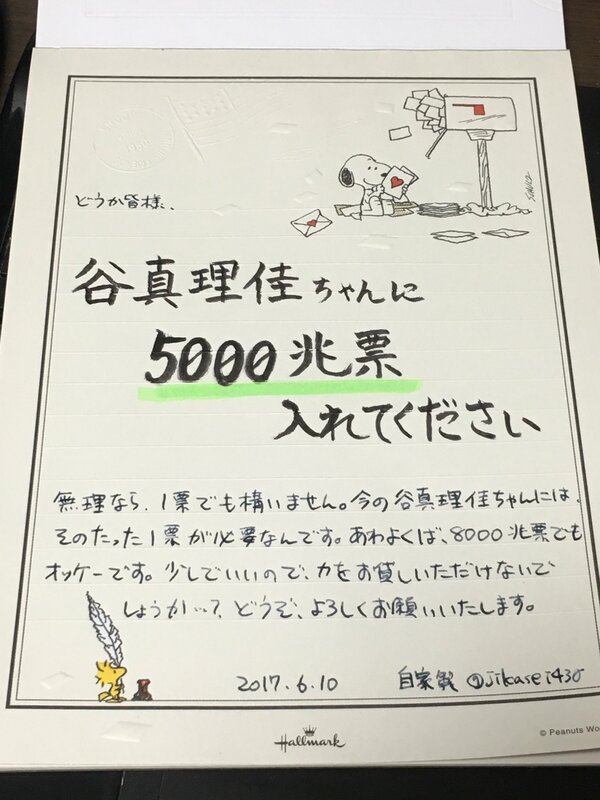 What Tani Marika needs now is the support and votes of many people and if possible 5 quadrillion yen or land with a value of 5 quadrillion yen. I know I am being annoying!!! You are free to block, remove, mute me!!! Please!!!!!! Amen!!! Thank you very much for your support. This is Jikasei. Sorry to my followers for flooding the TL with tweets about the General Elections every day. However, no matter how many followers I lose or how many of my acquaintances block me, my thoughts for Tani to rank up are just that strong. Every year during this time I end up involving many different people into this so while I’m pushing my luck, I would like to ask for your support this year, too. Just 1 vote would be fine. I, Jikasei, will pay for all costs for your voting, so if there are any kind souls who will say, “I’ll support you,” please reply or DM me. Also, if there are any oil sheiks who can send me 5 quadrillion yen for free, please feel free to contact me. Sorry for bothering everyone. Thank you very much. Just like it is written in the title! This is SKE48 Team E, Tani Marika. For Tani, this was a very happy time indeed. I was allowed to be the MC for the mini Live! Seeing the fan’s smiles from the stage! I’m making sure to see the people that are to the side and in the back as well. Fan’s responses to me being the MC!!!! and that made me happy, too. With the members and fans! The time Tani spends with everyone is the most enjoyable. I wonder if Tani’s feelings are reaching the fans? is very precious to Tani!! I want to cherish this time. Mayaan (Sugawara Maya) did my hair today! Thank you for giving me a cute hairdo! It is really amazing~!! I’m grateful ＾＾!! who finished her graduation concert yesterday!!!!! I hugged her a lot. She looked very beautiful in her dress. She also smelled very nice. and her ditzy? talk, Tani loves it. 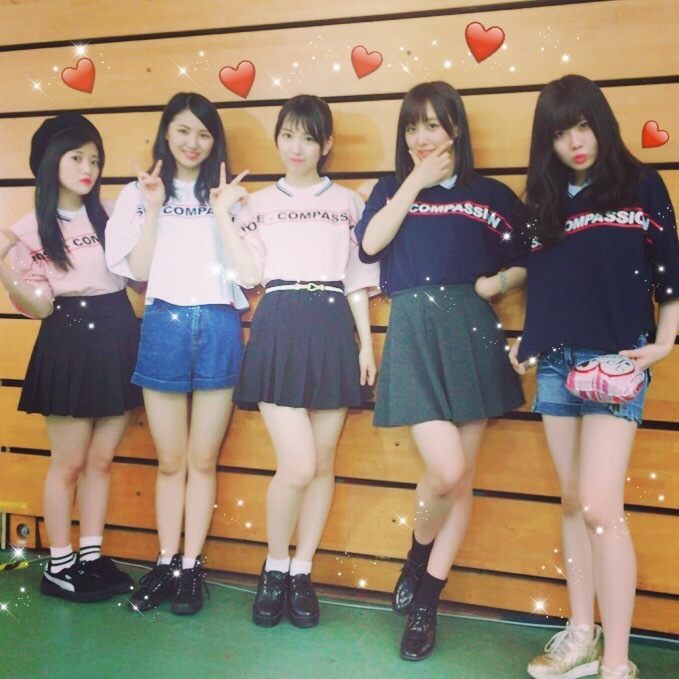 Today, the Heiwa-gumi wore matching outfits! What an awesome picture!!! I love it! Thank you for all the support you guys give me! I will enjoy tomorrow, too ( ^ω^ )!!!! I will be waiting for you at Gaishi Hall~! I will prepare for and review my lessons then do a brain workout then play games then sleep. This year’s Tani is supposedly very different than last year’s Tani: her room isn’t as dirty as it was before! Let’s support this ugly girl so she can fulfill her dream of ranking up!